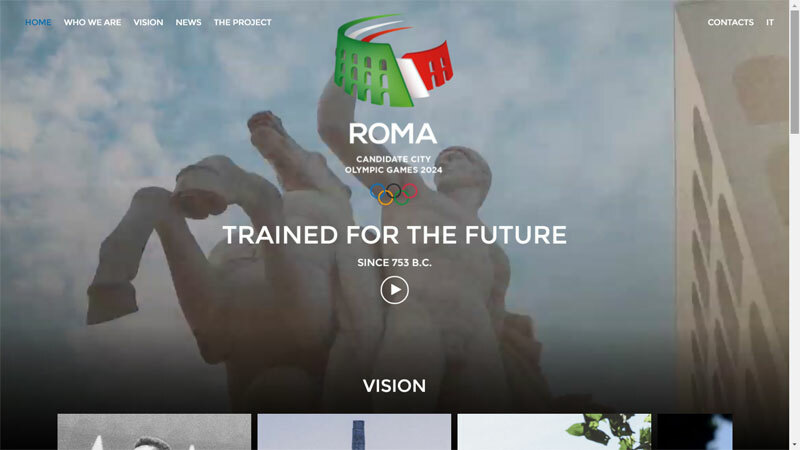 Rome’s bid to host the 2024 Olympic Games has won a key dispute over three Internet domain names enabling the Italian capital to launch a new Website at www.Roma2024.com. After a successful complaint to international arbitrators, the new domain and website were unveiled Friday at Wired Next Fest, a festival dedicated to technology organised by Wired Italia. The bid committee says the new design “breaks with tradition” and welcomes a catchy design, which will gradually be enriched with texts, videos, maps, news and photos. The bid’s former website had been at the less intuitive and less desirable domain name 2024Roma.org, a choice forced on organizers after, according to an official complaint to the UDRP – an international Arbitration Centre for Internet Disputes, they found that another party had registered the preferred domain names and was holding them in bad faith. The Italian Olympic Committee, owners of the trademark COMITATO ROMA 2024, filed a cease and desist order against a Spanish citizen Gustavo Valbuena last December 4 seeking the lawful transfer of Roma2024.com, Roma2024.org and Rome2024.org. In February, GamesBids.com published the exclusive results of an Olympic Internet domain and free speech investigation. Unaware that Italian officials had already taken action, GamesBids.com contacted Valbuena for comment on his domain name library on December 17, just days after the cease and desist order. Valbuena agreed to consider any questions about his domains but failed to respond to emails regarding the disputed Rome 2024 domains. At the same time an International Olympic Committee (IOC) spokesperson denied there had been legal action filed to recover these Rome 2024 domains. The UDRP case was filed January 25, 2016. Valbuena failed to respond to the complaint and the UDRP panel decided in favor of the complainant, transferring the domains in March. An additional key bid domain, Rome2024.com, is in the hands of U.S. resident Stephen Frayne and its ownership is currently under litigation by the United States Olympic Committee (USOC) and IOC. Frayne, the focus of the February GamesBids.com investigation is also in possession of hundreds of other similar Olympic city / Olympic year domain name combinations including some of interest to the Los Angeles 2024 Olympic bid – la2024.org and la2024.com. Like Valbuena’s Website, Frayne has also claimed the domain control represents freedom of speech, and contends that he’ll use the domain names for websites to “foster a balance discussion” about various bids. Frayne has responded to the litigation and the case is set to be heard late next year, after the IOC elects it’s 2024 host city. GamesBids.com has contacted Rome 2024 for comment on the acquisition of the domains. The bid committee believes the new domain and Website will help build momentum for the bid. “Ours is a nation marked by beauty, ingenuity. We are open to the world and we prove it every day,” Fabio Guadagnini, director of communications for Rome 2024 said. Rome, along with Budapest, Los Angeles and Paris are competing to host the Olympic Games in 2024. The IOC will choose a winner in September 2017.